The Bermuda Buccaneers Rugby Stephen's Selects tour in honor of Adrian Hassel began competing in the Las Vegas Sevens tournament. In typical Buccaneers fashion the boys started a bit slow in the first game against a pacific island team and very physical Mana team. Maya counter rucked is at every breakdown with 2 to 3 players and scored 5 Try’s as a result, when the Buccaneers kept the ball there were moments of brilliance but they just didn’t have enough ball, the Buccaneers would get a lone Try from Jahniko Francis. The second game the Buccaneers were on fire, they attacked up the middle and stepped the opposition and went up three Try’s to 0, Mikel Dill, Antonio Perinchief and Simeon Edwards all went over. 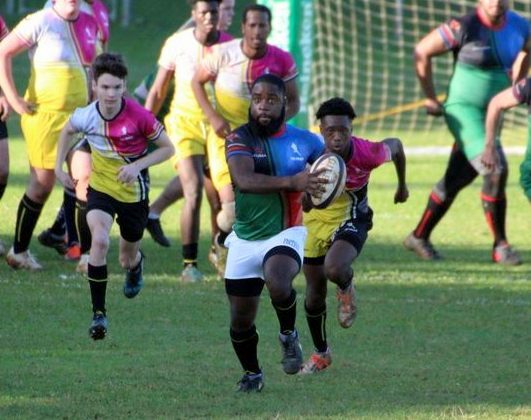 The Buccaneers would then take their foot off the gas as they thought the game was secured and the other team gained momentum and the game finished 4 Try’s a piece, with Perinchief scoring the Bermuda Try in the second half. The last 5 minutes was so chaotic that no one knew who won, not even the referee. After much debate it was determined that the Buccaneers won by 2 points. The final game wasn’t even close, from the kickoff the Renegades ran at the Bermuda Buccaneers, Raguel Dill and Francis defended fiercely and turned over the ball. The ball was spun out and the speed and athletic ability was too much for the other team as Edwards would go over. The opposition was twice the size of the Bermuda Buccaneers pack, who would win the scrum against the head setting up a 75m try by Avery Williams. Ndavia Williams also scored from 50m as did Dill and Francis. Needless to say after the Buccaneers started slow they finished on fire.